One of the most common questions I receive about retirement income planning is, how realistic is the idea of relying on natural yield in one’s portfolio to meet retirement income needs. The rational is that by relying on the natural yield from their portfolio, retirees can avoid drawing on their capital or selling fund units, thereby avoiding the dangers of sequence risk. The natural yield approach contrasts with the total return approach, which essentially ignores the difference between capital growth and dividends, and instead seeks to draw income from both in a sustainable way. The trouble is, this approach is bonkers for several reasons. Dividend and bond yields fluctuate significantly over time. This means that a retiree’s income will change significantly from year to year. This creates an unacceptable level of volatility in their income and makes budgeting nearly impossible. Once adjusted for inflation, natural income yield is highly unlikely to meet the spending pattern of most retirees, bar the very wealthy. Even if yield appear stable in percentage terms, the income received in £ terms will still be calculated in relation to the outstanding capital, which invariably fluctuates over the retirement period. Proponents of a ‘natural yield’ retirement strategy have offered little empirical evidence to back their theory. They erroneously focus on recent percentage yield of the FTSE 100 or FTSE All Share. Most retirees are more likely to have a portfolio consisting of bonds and shares, at the very least. And it’s crucial that any retirement income strategy works over a very long period and under various market conditions, including the extreme ones! So in this research, I set out to examine the natural yield approach to retirement income, using empirical data. This time, I’ve used the Barclays Equity Gilt Study (BEGS) dataset from 1900 to 2015. Unlike the DMS database which I used for my other research, BEGS decomposes equity and bond returns into capital growth and income yield. I created a portfolio consisting of 50% UK equities and 50% gilts, which is rebalanced annually. I examined the real natural income on a £100,000 portfolio for retirement periods starting in 1900,1905,1910,1915 …. to 2005 and 2010. I also included a retirement period starting in 2008, just to take my total number of scenarios to 20! Based on the dataset, I looked at a retirement period of 30 years. Retirees starting after 1985 haven’t completed the full 30 year period yet, so I’ve presented their results for the period covered so far. For instance, a retirement period starting in 1990 (Class 90) has had 25 years so far and a retirement period starting in 2000 (Class ’00) just 15 years! The real natural income is the natural yield from the outstanding portfolio, adjusted for inflation. I work on the basis that no income is taken from the capital and the retiree relies entirely on the natural income of their portfolio. No fees/taxes are applied to the portfolio. Obviously, the net natural income would likely be lower after fees/taxes and the key points hold regardless. The chart below shows the real natural income from the portfolio over the subsequent 30 year period (or less where applicable i.e. retirement dates starting after 1985). As you can see, regardless of the retirement date, a retiree relying only on natural income experiences a significant fluctuation in their income from year to year. Take for instance, our Class 1900 who started their retirement with a natural income of £4,550. By the second year, their inflation adjusted income fell to £3,897 and by the 5th year it was £3,005. But their troubles were only just beginning; by their 20th year in retirement, their real income yield had fallen to £1,024! I know no retiree on the planet who would consider these levels of fluctuation in their annual income to be acceptable. In the second chart below, I show the first year’s natural income, as well as the lowest, the mean and the highest real natural income over the entire retirement period. I also show the ‘income volatility’ in %, which is the standard deviation from the mean income over each retirement period. The implication is that a retiree living off natural yield may or may not start off with a decent income in the first year of their retirement. But they should expect their income to fluctuate like a yo-yo from one year to the next. And once you add in the effect of inflation, this yo-yo effect (income volatility) is simply unacceptable for most retirees. High-yield asset classes such as commercial property/REITs, hgh-dividend equities and high yield bonds tend to have large drawdowns, particularly during stressful market conditions. The chart below shows the cumulative total returns during the global financial crisis (12 October 2007 to 9 March 2009) of major asset classes, including high-yield ones during the financial crisis of 2008. As you can see, income yielding asset classes experienced larger losses. It’s crucial to remember that, even if the income yield in percentage terms on these asset classes remains consistent (which they mostly don’t), the actual income received by the retiree in £ is still affected by the large capital drawdown. Over-weighing high-yield asset classes invariably increases concentration risk and reduces diversification in the portfolio. The strategy relies heavily on the ability of the manager(s) to select high-yield stocks, bonds, property, before the fact, consistently over the very long retirement period. Good luck with that one. The implication of all this is that a natural yield approach is a bonkers retirement income strategy for virtually all but very wealthy retirees, who mostly rely on other sources of steady income. Another enlightening article Abraham that puts a little ‘science’ behind the argument rather than rely on some big firm with an agenda. Are the DMS and BEGS data sets you have used for your research freely available or do you have to pay for them? An interesting article Abraham, though your ‘attention grabbing’ headlines automatically make me want to challenge you. ‘Totally Bonkers’ I don’t think so. For the record we typically manage retirement portfolios pretty much as you describe, but it would be wrong of me (and you) to totally dismiss alternatives. For example, what about the income focussed investment trusts that have managed to increase dividends every year for the past 30, 40 and even 50 years through a mechanism of ‘smoothing’ the income payments? I might agree that Natural Income for a retirement strategy may be ‘bonkers’ for most people (and we have a couple of wealthier clients who wanted their income strategy based on natural yield – and it works) but ‘Totally Bonkers’? Thanks for the comments Dennis! I like the challenge, and always great to hear different take on these issues. 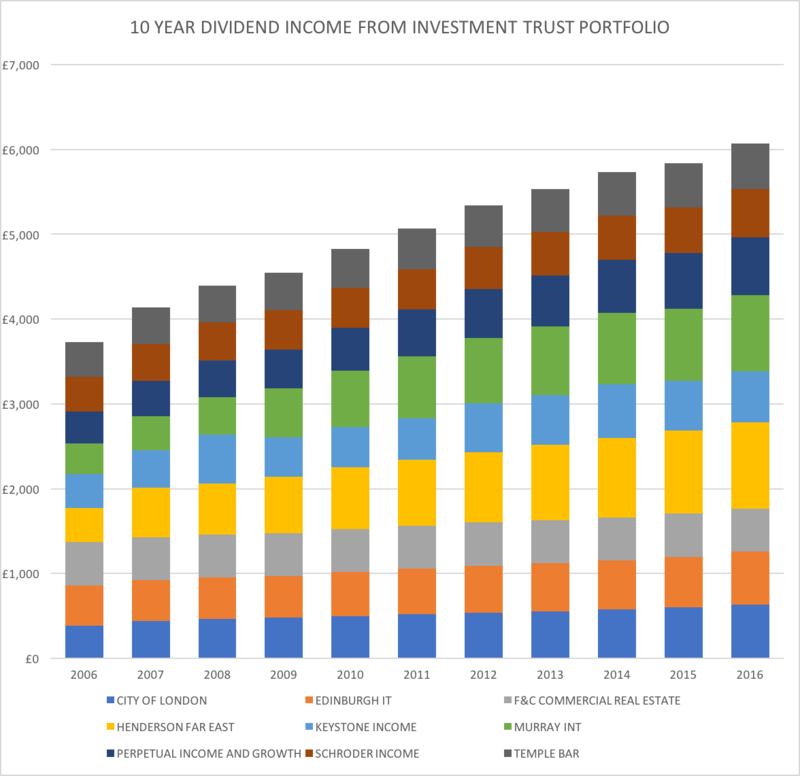 As I’m sure you probably know, my view on the AIC Dividend Heroes (https://www.theaic.co.uk/aic/news/press-releases/dividend-heroes-investment-companies-with-at-least-20-year-records-of) – list of trusts that have increased dividends for more the 30 years, comes down to the questions a) that list itself doesn’t tell you much in terms of whether the income received by the investor actually kept up with inflation over the period b) can you identify them before the fact, and will they do it for the next 30 years? c) how many similar trusts who attempted failed to do so? This article is incorrect, both in theory and in explanation. The practice is not about yield producing, but stable yield producing, which is where an intelligent adviser starts research. Running back tested portfolios from 1900 is a pointless exercise, and bears no relevance to anyone alive today, or their parents. Investing for long term rising income is the hardest task for an investment manager to undertake, however we do have the luxury of a swathe of long term divi producers to help out. Since Procter & Gamble produced their first divi in (I think) 1897, they haven’t skipped one, and in the last 60 years it has risen every year. Closer to home, City investment trust was the first animal over the 50 year hurdle of consecutive rises, and this year should see Bankers and Alliance Trust join them, Caledonia next year. These are not one hit wonders, and they all have competent revenue reserves to back up their payments. the leading reliable investment trusts had an average payout increase over the 15 years from Jan 2000 of over 6% per year – that’s the annual increase, not the yield. An investor receives an income that is his/her yield to his/her cost. Yield to current share price is only relevant to today’s purchaser. (Read anything Buffet, Malkiel or Ellis have ever written on divi investing). Murray International. A purchaser in Jan 2000 bought a share with an existing 3.18% yield. An investor buying in 2014 was buying into a 4.38% yield. However the 2000 investor’s 2014 yield was 9%. The share price paid in Jan 2000 was £5, the divi received in 2014 was 45p. The focus on current yield is maintained by those in the markets trying to encourage trading, and the luxury that an adviser has is to evaluate the investment, and income, for the individual client and their own, personal, unique portfolio. City of London’s divi in 2000 was 7.18p, and in 2016 was 15.9p. Share prices were £2.42 and £3.79 respectively, meaning the 2000 investor last year had a yield to cost of 6.57% – and capital growth of 56% which we are ignoring. It’s important not to take investment theory designed for institutional mandates and apply them to retail clients – the two cashflows are entirely different, not least because on retail we have the luxury of finite drawdown periods, and a known investment timescale. David Swensen, in his time at Yale, did point out that investing in ‘alternatives’ was very relevant to long term investing for them, in fact a key ingredient, only because the endowment’s time horizon was 150 years. Not true. High yield necessarily means ‘higher than the mean’, which to us simply means pushing the edge of the envelope, and that is anathema to long term income investing. The focus is not on high yield it is on consistent yield. Proven sustainability is key, and that can be researched and assessed via the published accounts, this year, last year, the year before…. When anyone in our back office team starts to get bogged down in the ‘science’ of investing I tape a pencil to the top of their computer screen – better than a pen in space. The income investment equivalent of the Russian pencil is the London listed investment trust. If you can buy City of London today on a 4.2% yield, and with annual growth of over 5% over the last 16 years, which part of the objective is not being met? More importantly, which of the two methods do you fully understand, and which of the two will the client understand? It is not totally bonkers at all and it is not only for the very wealthy. US Endowment funds use this approach very successful. It is for clients with very long timescale of retirement and it is probably the only successful approach. For example, I took two former “Skyscanners” employees and shareholders as clients who will retire in early 30thies, they have made their money already by selling the company to the Chinese. These people have a 60 years retirement timescale at which they decided to add their children retirement timescale too. Any other approach based on whatever stochastic modelling will give them a 70% chance they will run out of money, so as a result I thrown the stochastic model straight in the bin. Capitalism is rather simple, it is based on bottom line – earnings or net income. Companies have two options to distribute it to their shareholders for their own consumption or reinvesting (if not needed for consumption) or the company could reinvest it itself. Companies and private clients are in the same game, the game of earnings, investing some and consuming some. Retirement for a client is a consumption only phase. This also explain why for 30 years periods a stochastic modelling will show sustainable withdrawal rates close to the natural income of the portfolio. In a way this was expected. In fairness once you pass 25 years timescale in your stochastic modelling the propagation of uncertainty (also named propagation of errors) becomes so high that the best thing you can do is that instead to publish the result and believe the interval of confidence given by the computer, you better do what I did i.e. throw it in the bin. As a simple result from that, it would be riskier to start withdrawals from your own capital by using withdrawal rates that are higher than the income produced earlier than 30 years before your “estimated” death. It is worth remembering that the person who could only withdraw the income produced by his assets it is said that he is “infinitely wealthy”. Retirement spending was not invented in the last 150 years we have data on stock markets, it has a 2000 years history. We have examples in the Bible (including an asset allocation) but other religious texts as well. There was little we have added in this science in the last 2000 years using our computers, the only thing that we managed is to make the asset prices more volatile than 300 years ago and to question their “value” every 5 seconds and trade them every millisecond. People wealth was made by spending less than their earnings and saving some and other people’s wealth was lost by spending too much. History is full of examples. Retirement was based and it is still based on human capital as long as income producing assets (invested capital). There are examples of human capital too: churches wrote annuities in the 15th century and long before that Governments wrote insurances (State pensions were invented in antiquity) to their people. Also families self-insured by having children. But all these are based on earnings, this is the blood that flows within the vein of the retirement concept. I am not arguing here to invest in very high income assets at the expense of lower income producing assets. Yes, very high income producing stocks are high risk as the high income may not be sustainable, however stocks paying medium to high dividends (sustainable dividends) have a higher expected return than “growth stocks” and also present slightly lower risk. The explanation could be simple, some growth companies have negative earnings (they are in a consumption phase) or they have to reinvest all their earnings to remain in business/grow their business. This is why I do not recommend investing in private equity! I am not saying that a retiree needs to be religious and only spend exactly the income of his investments, nothing more or less. Than may be bonkers. There are moments when earnings are higher and it is good to put some aside for future consumption. And there are moments when earnings are negative and those reserves need to be called upon. Earnings are a function of economic activity, this is why we keep our eyes of the bigger indicator of earnings of all – GDP. When things are good and earnings are high and company pay some of them off in terms of dividends. When economic activity is poor, company have negative earnings and become consumers as well, spending from their reserves. Retirement science does not need to be complicated, it is a result of economic activity. Last, I would argue that a total return approach is a income based approach as well, without earnings there is no return whatsoever. The yield is a function of capital value, therefore if capital values are fluctuating so is the % yield. This is why dividends are quoted in cash per share terms. Investment 101. Head first into the yield trap Abraham. Yield is an abstract number derived from two values; price and dividend. The dividend is NOT calculated by applying a ‘yield’ factor to the price. The yield is a by-product of the dividend declared divided by the share price at a point in time. Over the long term dividends generally remain stable (they are decided by management, not the market) and grow with the rising profitability of the company. Share prices, on the other hand, can fluctuate wildly which pushes the yield up and down in the short term not the income. Over the long term, share prices and dividends rise which means the yield remains, on average, roughly the same. History shows that dividends are the more stable component whilst share prices can fluctuate sharply. Oh dear, oh dear. Try again – looking at historic data on the actual £ distributions and not “yield”. I think it’ unreasonable to focus on one approach, when other approaches have just as many flaws. It does make sense to use the natural income from a portfolio to help fund the income required. After all, if you reinvest dividends during a period of withdrawals, you will be taking unnecessary risks (I dont think that anyone would recommend investing in shares for a period of just a couple of months, but so many advisers accidentally do this by using accumulation funds during a decumulation period). Douglas Moffitt, a contributor to my newsletter, The IRS Report, has successfully applied this strategy for nearly ten years. He has written of its pros and cons ever since. It has a set of rules he abides by to manage it. More recently he created a second portfolio, this time an instant version created in a day rather than over a year or more. Every article now resides online at http://www.RIRP.co.uk. Please take a look and see for yourself how successful his approach is. I am sure you’ll find your eyes truly opened. One of the problems that the analysis highlights is the cost of protecting a portfolio from market downtowns. A 50% investment in an instrument (gilts) that have a below inflation rate yield will decimate the natural yield of the portfolio. With a 30+ year investment horizon for retirees one has to decide how to balance the risks of inflation against depletion of the portfolio either through longevity or market collapse. Without doubt it is possible to construct an income generation portfolio that will provide year on year income increases from an annuity beating base with the near certainty of capital growth. A simple portfolio of income Investment Trusts would have provided just such performance even during the economic crisis and market downturn of 2008/9. I have analyzed the annual dividend return such a portfolio using many of the ITs that I myself have invested in. A 100k portfolio of 9 popular Investment Trusts purchased in December 2006 would have provided an initial income of 3.7K/annum growing to 6K by December 2017. An income increase of 63% compared to an RPI of 37% and with an increase in income every year and a capital increase of more than 50K. Not many professionals would be able to recommend a 100% equity allocation but as all the statistics show there is no other asset class that can provide such a high degree of growth and inflation protection. Its just comes down to whether one can accept the risk of being financially wiped out by a 1929 type crash – but if the alternative is the higher probability of an impoverished retirement then maybe its a risk with taking.